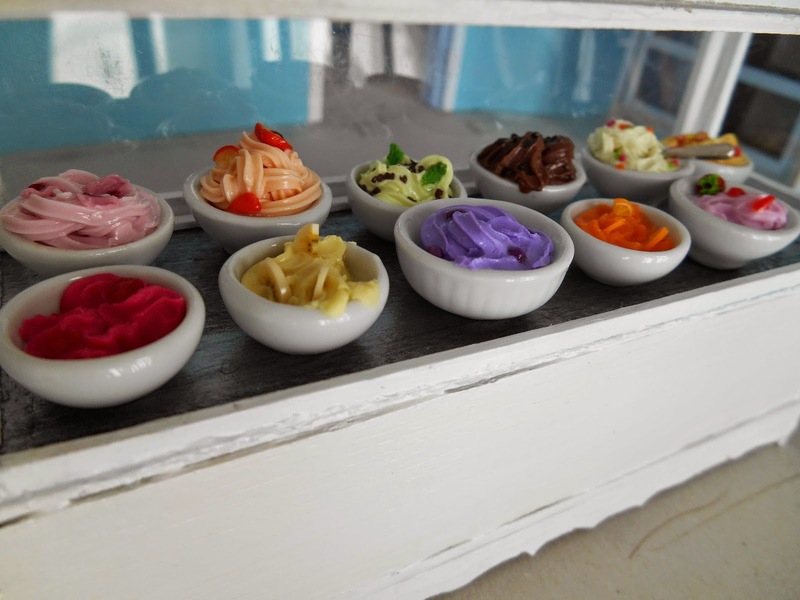 I want to share with you a sneak peak of my ice cream shop this time and without revealing too much (otherwise the surprise factor will vanish :p) a view of some of the flavors I made for this project. Chocolate, strawberry ... brown and soft pink, this is how I thought about ice cream when creating it. It had to be a varied palette of colours otherwise it was going to look like a monochromatic ice cream counter -.-" and that is not appealing! So some of the classical flavors where chosen, but others I had to research further so as to provide a nice rainbow look! It was so much fun doing this that I believe I'm going to make another ice cream counter with ice cream bowls to sell at my Etsy shop when I'm done with the project :). I have 11 of 12 flavors so far, for the last one ... which one would you like me to reproduce? the audience is welcome to give its opinion! Chocolate, frutilla ... marron y rosa claro, asi es como pense acerca del helado cuando lo estaba haciendo. Tenia que ser una paleta de colores variada de otra forma iba a verse como un mostrador de helados monocromatico -.-" y eso no es atractivo! Algunos de los sabores clásicos fueron elegidos, pero otros los tuve que buscar un poco mas para poder lograr un lindo arco iris! Fue tan divertido hacer esto que creo que voy a hacer otro mostrador de helados con sus bowls de helados para vender en mi tienda Etsy cuando termine este proyecto :). De izq a der, atrás: sakura (flor de cerezo), durazno, menta con chispas de chocolate, chocolate, torta de cumpleaños y mango. Tengo 11 de los 12 sabores hasta ahora, el ultimo ... cual te gustaría que reprodujera? la audiencia es bienvenida a dar su opinión! Cookies and cream ... nice combination! Sandía con pepitas de chocolate, ummhh buenísimo. Deliciosos!!!!! A mi me encanta el de chocolate blanco con frutas del bosque!! Me encanta ese contraste!! no tengo ningún helado blanco .. gracias por tu contribución Pilar! Tu sabor va a ser el ultimo bowl de helado! SUMMER SALE at my Etsy shop!! !